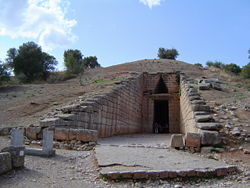 Beehive tombs, also known as Tholos tombs (plural tholoi), are a monumental Late Bronze Age development of the Mycenaean Civilization that eventually replaced the old style of chamber tombs. It was named such after the vaulted dome shape of the main burial chamber that resembles the shape of a beehive. The change in burial styles has been a significant development in archaeology for it signifies a shift in ancient Greek society. The beehive tomb required considerable effort to construct, and thus was only available to powerful leaders. The appearance of similar structures in different cultures is also of interest to social scientists, in some cases indicating the influence of one civilization over others, in other cases indicating the lack of sufficient common features, suggesting independent development of the structures. In all cases, however, the beehive tombs are a fascinating example of human creativity and desire to respect and honor those whose lives impacted their society. Most often, beehive tombs were placed underground, either built deep into the side of a hill, or, as in areas with flat parcels of land, were entirely subterranean. In the case of the latter, if any part of the structure protruded above the ground it was carefully covered using earth that was held in place by a retaining wall. Inside, they were built as corbelled arches, layers of stone placed closer together as the arch tapers toward the top of the tomb. The tombs usually contained more than one burial, in various places in the tomb either on the floor, in pits, or on stone-built or rock-cut benches, and with various grave goods. 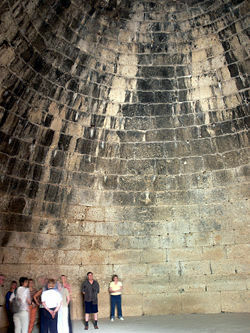 The tripartite structure of the tombs is not always evident in the earliest mainland examples (for example at Voidhokoilia), but by the time the architectural type had left Messenia the separation into chamber, stomion, and dromos was fixed. The chamber was always built in masonry, even in the earliest examples, as was the stomion or entrance-way, which provided an opportunity for conspicuous demonstration of wealth. The dromos was often just cut from the bedrock, even in some of the earlier examples at Mycenae itself. In later examples, all three parts were constructed of fine ashlar masonry. Tholos buildings in Harran, Turkey. The oldest beehive tomb discovered thus far is in Messenia. The Minoan style of burial, the chamber tomb, had been the most frequent style used from about 1600 B.C.E. to 1100 B.C.E., due probably to the large influence the Minoans had over the Aegean region at the time. After about 1500 B.C.E., beehive tombs became more widespread, suggesting to many archaeologists that the influence of the Minoans was in decline. From Messenia, the beehive tomb spread to other areas of Greece, particularly Argolid, Laconia, and Attica. Treatment of the dead has been one avenue through which archaeologists have been able to glimpse the mentality of long gone civilizations. Developments in tomb structures usually correlate with developments in society. Hence, although the reason for the switch from chamber to beehive tombs remains in contention among archaeologists, there are nonetheless many agreed upon social implications arising from the change. As beehive tombs became more popular in Greece, they began to become regulated to the highest class of citizens; only royalty and the highest non-royalty bureaucrats and their families were entombed in beehive structures. This suggests that there was a strict social stratigraphy in Greece at the time. The infrequency of later beehive tombs also indicates the eventual consolidation of power in Greece, as the once city states became larger conglomerates, requiring fewer beehive tombs for the fewer persons with power. The beehive tomb design for the most part stayed within Greece. However, there are examples of similar designs from around the world, although it is not clear if they were culturally diffused from Greece, or if they were concurrently emerging but separate phenomena. Perhaps the most famous beehive tomb in Greece is the Treasury of Atreus, sometimes called the Tomb of Clytemnestra, located in Mycenae, Greece (on the Panagitsa Hill) constructed around 1250 B.C.E. The name of the tomb is misleading, for no one is exactly sure who was meant to be entombed in the chamber, and no artifacts have been recovered there. Due to the impressive size and exact masonry of the tomb, it is assumed that it was built for a king who would likely have been buried with treasures and weapons, yet none have been discovered at the site. Still, it remains one of the most impressive burial structures in Greece, and was the tallest and widest dome in the world for over one thousand years until construction of the Temple of Mercury in Baiae. The earliest stone-built tombs which can be called “beehive” are in Oman, built of stacked flat stones that exist in nearby geological formations. They date to between 3500 and 2500 B.C.E., to a period when the Arabian Peninsula was subject to much more rainfall than now, and supported a flourishing civilization in what is now desert to the west of the mountain range along the Gulf of Oman. No burial remains have ever been retrieved from these “tombs,” though there seems no other purpose for the buildings. They have only superficial similarities with the Aegean tombs (circular shape) as they are built entirely above ground and do not share the same tripartite structure—the entrances are usually an undifferentiated part of the circular walling of the tomb. Not far from the ancient Thracian capital Seuthopolis, in Bulgaria, lies the famous brick beehive tomb of Kazanlak. Situated within a necropolis, the tomb is composed of a narrow corridor and vaulted burial chamber, decorated with murals of ritual funeral feasts. Dating back to the fourth century B.C.E., like the site in Oman, the similarities to Aegean beehive tombs are minimal. This may be due in part to the possibility that beehive tomb designs did not originate in Greece, but are common phenomena in various parts of the world. ↑ Dartmouth College, Mycenaean Tholos Tombs and Early Mycenaean Settlements. Retrieved October 5, 2007. ↑ Duckeck, Jochen, The Treasury of Atreus - Tomb of Clytemnestra. Retrieved October 5, 2007. ↑ World Heritage Site, Thracian tomb of Kazanlak. Retrieved October 5, 2007. Thracian Beehive Tomb of Kazanlak. This page was last modified on 13 December 2016, at 17:39.